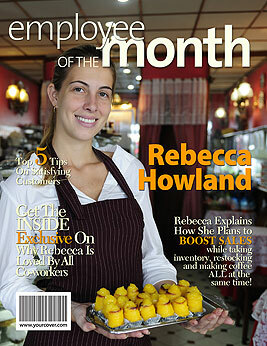 An Employee of the Month personalized magazine cover is a unique gift or award to congratulate an employee on a job well done. Features your photo and custom headlines about the employee, their accomplishments and your company. Looking for a unique employee recognition idea? When trying to come up with different ways to recognize employees for a job well done, you want to be able to present them with something that makes them feel special and that highlights their contributions to your company. Now you can make them feel like a star by putting them on their very own “Employee of the Month” personalized magazine cover! This employee recognition award is a step up from the standard employee of the month award certificates. Not only is it personalized with their photo but you can customize the headlines on the magazine cover template to be all about the company and the achievements of that particular employee. Simply upload your photo to the YourCover magazine cover generator then revise the default headlines to be all about the employee and your company. One of the great features of YourCover is the duplication feature. Create your first Employee of the Month magazine cover with custom information about your company; add the employee’s photo and the specific information about that month’s achievements. The next month “duplicate” the cover, all the company info stays the same but you only have to add the new photo and employee’s name. Each employee recognition award is unique and distinctive yet maintains a company theme. The unique back cover feature is available just in case you have more photos and info than can fit on the front. When you are done you will have created an employee award that will be appreciated and displayed for years to come. In a hurry and need a last minute employee of the month award? Just upload your photo, personalize the headlines and you are done. Simply purchase the downloadable photo file for an instant employee recognition gift that you can print at the office. Or let us print your personalized magazine cover for you; we also offer frames, posters, mugs and other accessories as well as a gift service, rush shipping and international shipping. The best employee recognition idea is a fake magazine cover from YourCover – an employee award as unique as your employee.